As we have had a recent upsurge of interest in Choral Evensong up and down the country, I think it is only a matter of time before it gets noticed and becomes part of mainstream TV and Radio scheduling. A regular Saturday evening prime time spot, perhaps? Can you just imagine?! Presenter (Garfield Lineker): Good evening, and welcome to another bumper-packed edition of "Choral Evensong of the Day" featuring some of the very best highlights from the action at today&apos;s cathedrals and churches from around the country. With me in the studio tonight to present their expert analysis we have Alan Sheared and alongside him Alan Handsome, who between them have notched up a fair few evensongs over the years. Garfield: So we start tonight with a visit to Liverchester Cathedral and a local grudge match in the Antiphonal Trophy between Decani and Cantoris as they compete for vocal dominance in Woods "Hail Gladdening Light". Your commentator, Barren Davis. BD: You join us for the second set of responses, and you have to say that during the first half of evensong, Cantoris seem to have the upper hand, with a show of real class from the basses, particularly in the Walmisley Nunc Dimittis, Trevor? Trevor Bloke: Yes, well they certainly have been showing their strength in depth, Barren. The tenors, watching the conductor throughout the &apos;Mag&apos;, came in together beautifully – that&apos;s something I&apos;m sure they will have practiced in the choir school – a wonderful &apos;set piece&apos;. And you have to say, their Director of Music, Adam Shame, will have been encouraged to see the younger trebles and their show of commitment in the opening responses. BD: This is a real &apos;shop window&apos; for some of the younger singers, who will want to prove themselves in the big arena. I know that there are many scouts here tonight looking for the younger talent on show – like Toby Scoggins the young Decani tenor. He&apos;s a real talent, he&apos;s got great pitching and has been noticed by some of the big cathedrals like Gork Minster, Burham Cathedral and even St Ednas. Trevor: It&apos;s a big, big test for the youngsters, who could be offered scholarships if they put in a good performance here tonight. BD: Yes – the money that these young choristers can make in the modern era is quite astounding – some get as much as £12 per month, money we could only dream of in our day, Trevor. So, now to the action – the anthem is underway and there is some excellent watching from both sides. Textbook intonation there from the Decani altos – the Director of Music really likes that – look at his face – just LOOK AT HIS FACE! Trevor: It&apos;s really difficult to seperate these two sides at the moment – the discipline, the commitment, the tuning, the bellowing altos… I only hope that this can be settled in normal time. BD: Yes, Tevor. It always seems unfair when it has to be decided by an extra verse anthem and sudden death sing-off. It needs someone to really take this anthem on, and put the result beyond doubt. But ….here come the Decani trebles with a long run down the right with "therefore in all the world.." followed by Cantoris answering back on the left. But the Decani trebles hit a long soaring top A that sends the congregation into ecstasy. Some people are on their feet – they think it&apos;s all over…. it is now. Trevor: You have to say that Cantoris will find it very difficult getting back into this tie, after that, they only have the final hymn and dismissal to hit back at Decani, and I don&apos;t think they have the energy in them. BD: Yes, their heads are definitely down now, Trevor..
Trevor: That&apos;s because they&apos;re praying, Barry..
BD: Oh Yes, sorry. It&apos;s all over here at Liverchester – so back to the studio. Garfield: Alan, a great contest there at Liverchester. What do you think, Alan – a real game of men and boys against boys and men where in the end, you have to say the men and boys were stronger than the boys and men. Alan 1: Yes – the difference in class can be summed up in this little passage of play, where in the psalm, the Cantoris basses are just casually looking around, not paying attention. Just look at that – terrible diction – they&apos;re just asking for trouble. Alan 2: And that is picked up by the Director, look at him glaring at them. Does he not like that?! Garfield: I can see them being out on a free transfer at the end of the season – but where can they possibly go from here? Alan 2: ..err..nor altos or tenors…? Garfield: So let&apos;s now visit the other end of the table with an evensong full of incident and controversy from Great Snogging Parish Church in Sproutshire. Your commentator, John Notson and alongside him, Mark Lorryson. JN: A lovely little church, here in Sproutshire, with a fair sized congregation waiting to see this little choir take on the mighty Stanford in A, and the Mendelssohn &apos;Hear My Prayer&apos; in one service tonight. I&apos;m guessing they&apos;ll be showing a 4-4-2 back line, with only 2 Altos – it&apos;s certainly a risky strategy, Mark?" ML: It&apos;s a big, big risk. I hope it doesn&apos;t backfire on them in the Mendelssohn, leaving them exposed..?" JN: It certainly is a big, big risk, Mark. But they do have the help of a youngster on loan for the occasion from Pilchester Cathedral, young Archibald Head – just ten years old, and taking on the solo for the first time. ML: And you have to take your hat off to the organist tonight, Ernest Lee Peddling, for working on that tricky introduction to the Stanford &apos;Mag&apos;. JN: Yes, if there are any young organists watching, I&apos;m sure they will be inspired by his text-book registration there. Perfect crescendo and rising thirds in the right hand – what a player! 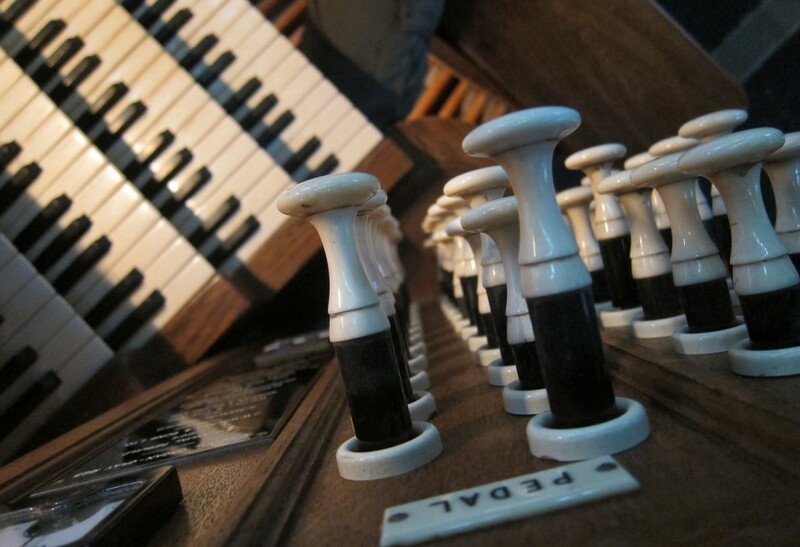 And he&apos;s so young – a real rising star in the organ world! ML: A controversial decision though, by the Conductor, to beat one-in-a-bar though. That seemed to confuse the older basses? JN: Yes – experience certainly shone through, though, Mark, as they weren&apos;t watching anyway! ML: You have to take your hat off to these smaller choirs taking on the bigger canticles. It&apos;s a real team effort, right the way through the church to achieve moments like these. JN: A proud day for the smaller church choirs – and you have to say that Choral Evensong is the winner here, Mark. ML: The Choir Director, Frank Lee Dire, was speaking to me before the Evensong tonight, and he summed it up like this "Some people think Choral Evensong is a matter of life and death. I don&apos;t like that attitude. I can assure them it is much more serious than that." Garfield: Great stuff there, from Snogging. Now it&apos;s time for October&apos;s &apos;Final Amen of the Month Competition.&apos; Remember to send in your votes by email, stating your 1st, 2nd & 3rd place choices. The winner who matches our experts&apos; opinion will receive 2 tickets for the &apos;Choral Evensong Final&apos; at Wembley Stadium in June. You get a chance to meet the Choir Directors before the final, meet some of the choristers, and you will receive a signed surplice from the winning choir. That just about wraps everything up for this evening – remember if you want to see exclusive coverage of a game of football on the BBC, tune in to Sunday at 4pm for a live broadcast of a football match on BBC Radio 3 – repeated on Wednesday. Next week on &apos;Choral Evensong of the Day&apos; we feature the local derby from Derby and the knockout stages of the RSCM cup, featuring lower league and non-league choirs battling it out for the right to play the &apos;big boys&apos; in Round 3. ( Theme Music Voluntary: Toccata by Boëllmann. Closing titles & footage of various end of service processions. Shades of Peter Schickele’s Beethoven: Symphony #5 presented as a sports broadcast!